Find out what successful entrepreneurs have to say about starting and operating a business. This guide to opening an auto customizing and restoration business offers crucial how-to information you just can't find anywhere else. Thinking about opening an auto customizing and restoration business? We tell you what you need to know to get started. Most entrepreneurs are passionate about their work. But when it comes to auto customization, conversion and restoration, passion is the force that drives both restoration service providers and their customer base. If classic cars don't excite you, then auto restoration probably isn't the right way to turn your entrepreneurial dreams into a reality. 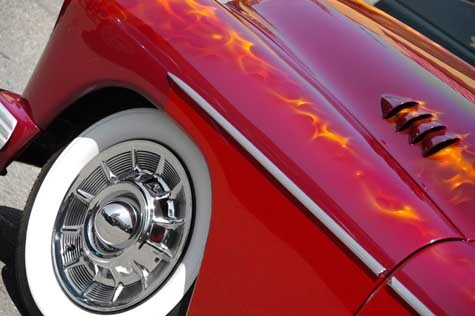 The simple truth is that auto restoration businesses are gathering places for classic car enthusiasts. Most auto restorers sell DIY parts and accessories as well as services, so it's important for startup entrepreneurs to be conversant in the industry and active in the local classic auto community. One of the common mistakes startup auto restoration business owners make is to overspend on shop setup. A highly visible location would be nice, but the reality is that a commercial lease in a less costly, out-of-the-way location can be just as effective and can provide room for growth at the same price point as a smaller spot in high traffic area. Also, your startup doesn't need shiny, new tools and equipment to deliver first-rate auto restoration services. It's likely that you have already accumulated a certain amount of tools and equipment as a hobbyist, which can be augmented by buying cost-efficient merchandise on the secondary market. Auto restoration and conversion retail is a $1.9 billion per year industry in the U.S.
As an auto restoration parts retailer, you'll need to study retail best practices as well as the latest product offerings in the classic and antique car parts marketplace. To improve your customer service and expand your geographic reach, consider developing a good business website that features a virtual catalog and online retailing mechanism. If that sounds intimidating, don't worry. These days there are plenty of turnkey online retailing options available to small businesses that lack dedicated technology personnel. To make sure you've covered all your bases, consider using business plan software during the writing process. The best business plan solutions can be tailored by industry, incorporating highly relevant metrics into your auto customizing and restoration company's business plan. A quick review of Gaebler's business plan software packages article is great place to begin your search for the solution that's right for your auto customizing and restoration business. Well in advance of opening an auto customizing and restoration business in your town, it's a good idea to find out what the competition looks like. Use the link below to get a list of local competitors in your city. Just enter your city, state and zip code to get a list of auto customizing, conversion, and restoration businesses in your community. Once you've finished assessing the competion, you really ought to speak with somebody who is already in the business. If you think your local competitors will give you advice, you're being overoptimistic. It'd be crazy for them to teach you the business. However, an entrepreneur who owns an auto customizing and restoration business in a different city can be a great learning resource for you, as long as they don't view you as a competitive threat. Indeed, many experienced entrepreneurs enjoy offering advice to startup entrepreneurs. Our estimate is that you may have to contact many business owners to find one who is willing to share his wisdom with you. Where would you find an entrepreneur who is running an auto customizing and restoration business in another community? Many would-be auto customizing and restoration business owners are perplexed by those who encourage them to buy a business rather than starting one from scratch. Yet many new entrepreneurs find it hard to resist the allure of an auto customizing and restoration business startup. The availability of acquisition capital should be a major factor in your decision. Commercial lenders are usually more inclined to fund acquisitions than startups. Although there are a lot of factors to consider, the decision to buy a business to get acquisition capital almost always pays off. If you want to minimize your chances of failing, you should consider whether there are good franchise opportunities that would be right for you. Before opening an auto customizing and restoration business, you ought to assess whether there are good franchise opportunities available that might increase your chances of success. How can we improve this article on launching an auto customizing and restoration business? If you've got something to say or have a question, please add a comment below. Are You Already an Auto Customizing, Conversion, & Restoration Business Owner? Do You Sell to Auto Customizing and Restoration Businesses?